Baby Boomers love cars. Their kids? Not so much. That’s the upshot of a new survey by the research firm Arity, which reveals a stark generational divide about cars and driving — and how few alternatives Americans of any age have for getting around. The main common ground? 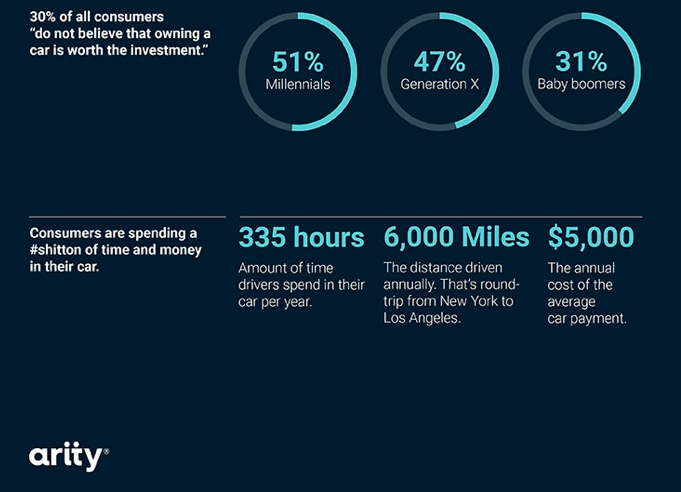 Everyone — Baby Boomers, Generation X and Millennials — drives. And they drive a lot. The average person in the study, by an arm of Allstate Insurance, spent about seven hours a week in his or her car, logging about 107 miles. Americans spend about three times as much time driving every years as they do on vacation. But here’s where the young-uns differ: More than two-thirds of Baby Boomers said their car was worth more than the cost of maintenance, but only 49 percent of Millennials felt the same way. So Millennials don’t share their parents “love affair” with driving, but they are mostly without alternatives. Only 13 percent of respondents said that they could “live without having access to a vehicle” According to the survey, 40 percent of everyone from all generations had never tried an alternative to driving, like public transit, biking or ride-hailing apps. The study demonstrates that there is a great untapped demand for alternatives to driving including transit expansion and bike infrastructure. If Democratic Congressional leaders take up an infrastructure bill in the next few months, this should be a big focus — if they want to lock in the younger generation, that is. One of the reasons we don’t currently think about congestion in bike lanes is largely due to the fact that bikes are single-width. So, like fixing congestion in bike lanes, the first priority for fixing congestion on highways or roads is to entice commuters to switch from side-seated, too-wide vehicles to narrow vehicles. Given the popularity of single and duo occupant driving, prescribing not driving is a dog that won’t hunt, so it’s best to give better options which include the same benefits that currently single and duo occupant driving provide. I charge the car in the Northwest Suburbs and downtown Chicago, so, like the electricity that’s powering the computer you’re currently using, it’s not completely renewable or wind/solar sourced at this time. Still, for the same reason you wouldn’t want a gasoline powered computer, electric powered cars are much, much better. Regarding the Metra; how do you fix the outrageous transit desert issues that cut people off frequent public transit service? https://www.chicagotribune.com/news/columnists/ct-transit-deserts-met-20140804-column.html My preferred solution is to create single-width, highway-capable, road and weather protected, 100% electric (allowing for renewable energy charging) vehicles allowed to drive in narrow paths and park in narrow spaces. What you propose is theoretically plausible but not necessarily cheaper. Light rail/monorail costs are more up front than any vehicle tied to roadway infrastructure. You have to account for near-constant highway/road upkeep with the increased capacity & the maintenance costs associated with each vehicle. In the end, you can’t beat geometry. A heavy or light rail care (preferably electric) will be more efficient, sustainable, and carry more passengers per hour than any light micro-vehicle, not matter how many you put on the road. That’s just geometry. For rural & exurbs these vehicles could work, but not suburbs. Vehicle throughput is far more important to suburbs and cities than geometry. If buses and trains are geometrically superior to bicycles and motorcycles, why not ban bikes and motorcycles and build double or triple width buses? I live in a northwest suburb of Chicago, and I choose to drive a Leaf and charge it in a parking garage Monday – Friday for convenience, speed, flexibility and very low fuel costs. On Saturday, my wife takes my daughter to her ballet classes downtown and she drives the Leaf for the same reason. We have the Metra option, yet we still choose driving. Like bike-share for highways, a thin, 100% highway-capable narrow car lease program for city and suburbs would definitely cheaper and far more popular for suburban use. Several years ago, the Chicago Tribune wrote an article about the RTA proposing a $2.3B plan for suburban bus rapid transit – not much different from the light rail or monorail you suggest. $2.3 Billion paying for a thin 100% electric car share program would resolve traffic congestion, provide a transportation system with far cleaner air, and, most importantly, give those citizens suffering in transit deserts a far better choice for commuting. I asked several neighbors whether they would prefer taking a suburban bus or driving in a thin car with thin lane and parking space privileges. Not surprisingly, they answered unanimously; they would prefer thin cars. People like you are destroying the planet and you just don’t care. Jesus Christ it’s been like three weeks. Are you still going on about this? Biggest bunch of whiners here I’ve ever encountered.